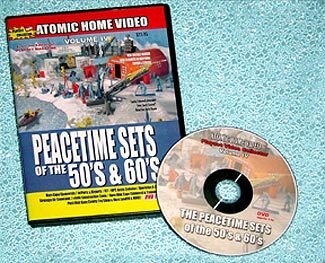 Atomic Home Video joins Warner Brothers, HBO and Discovery Channel as winners of the 2008 Telly Awards. The prestigious Tellys are coveted by over 14,000 entrants submitting their best work. For Atomic, At the Alamo was their sole entry and achieved a Telly Bronze statue, made by the same people who mint the Academy Awards. 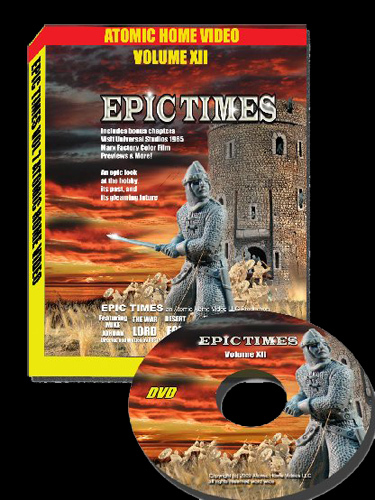 Each DVD is presented in full color keep case and shrinkwrapped intended for your permanent collection; even the DVD disc itself is gloriously full color, an increasing rarity these days but its all meant to increase the high quality and good fun. Get the overview of these fabulous playsets showing over 22 great sets from Farms, Rev War, Giant Blue & Gray, Western towns, to Operation Moonbase and preview some great new sets! Comprehensive, and exciting. Classic Vintage Toys from Epic Movies: Spectaculars by Marx! Ben-Hur, Assemble a MIB Vikings & Knights Castle, Marx Alamo, CTS Alamo, Collectors Basics, Conte's Longest Day, much more plus! See Jordan race Messala in the Ben-Hur Arena! The Great Marx Battle Playsets of the 50's and 60's, including Training Centers, Battlegrounds, Desert Fox, Iow Jima, American Patrol, D-Day Battlegound, Guns of Navarone. 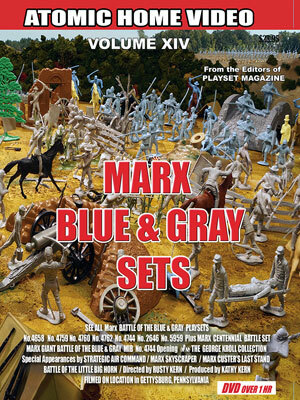 Revised edition featuring about 1 hour of vintage toy soldiers, et, boxes and accessories by Marx! Marx Cape Canaveral Sets, Marx I.G.Y. Arctic Satellite Base, Marx Strategic Air Command, #4444 Construction Camp, Deluxe Reading X-500. Open a MIB Cape Canaveral! Open a MIB Armed Forces Training Center! Visit the Marx Landfill! and MORE! Bonus chapter shows mint groupings from IGY and Cape Canaveral. 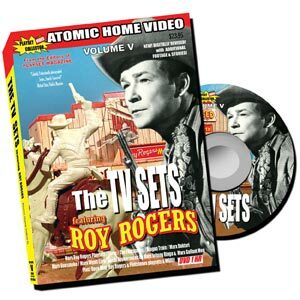 We examine Marx sets that were based on TV shows featuring lots of Roy Rogers sets including a Mint boxed set opening! Lots of gorgeous set-ups of Marx Zorro, Wagon Train, Untouchables, Gunsmoke and Daktari. Plus, MIB Flintstones set opening and more! Follow the thread of your youth back directly into the heart of the factory that helped shape it. Here is the very place you've seen named on the side of nearly every Marx playset carton. A haunting tour conducted by Marx VIP Mr. Bucky Livingston, former factory GM, in a nostalgic, reflective video for the Marx affectionado. You'll actually go inside both factories and meet the men who ran the machines and flatline; see the park that Marx built. As originally released, this film has none of the "action" of our other movies and is recommended for the dedicated or advanced collector. Approximately 30 min. Stereo / Color. Tons of playsets and playset displays! More than a decade after the original film was made, we return to find some great new changes and TONS of plastic. The Official Marx Museum and Kruger Street Museum have been built. Check out the Marx Convention. You'll lick your lips at a fabulous sale with 100's of playsets and see who picks what; tour both museums, and see a presentation on the Marx demonstrator boards by PM's Demo Man George Kroll and bonus "The Foley Tank" chapter with Rick Eber. Wide Screen Approximately 30 min. See the real War Lord Tower . . .
plus Marx Factory Color Film, Previews & More! The Greatest Space Toys of the 50's and 60's. 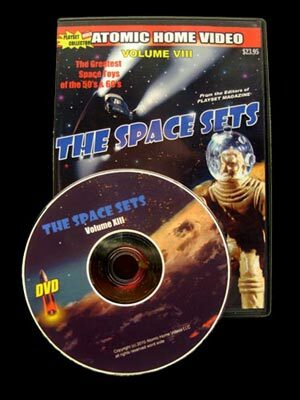 Incredible color and space fun with Tom Corbett, Rex Mars, Captain Space and rare Space Patrol playsets and all their figures and variations, plus some of the most extensive space collections in the world. See the real saucers and monsters used in Star Wars, Day the Earth Stood Still and The Time Machine. Then it's back for more of the raresst and most beautiful space toys with THE MOST ACKNOWLEDGED EXPERTS IN THE WORLD. Mark Young author of "Blast Off" and David Schafer, collector. Featuring Bob Burns and hosted by Rusty Kern. 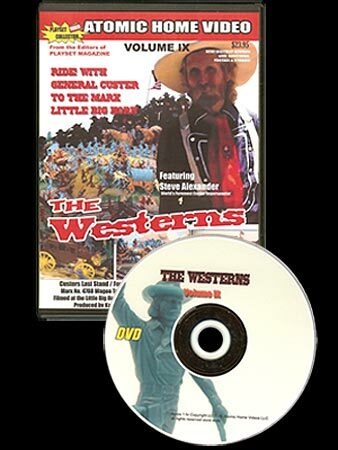 Ride with General Custer through the Wild West to explore the best Western sets by Marx! Filmed on the Little Big Horn River at the exact spot of the battle! 4 "BIG GUN SETS" MIB Openings! 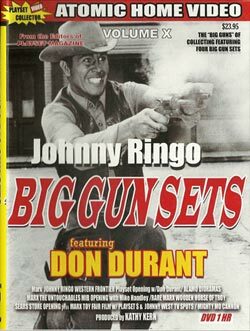 Johnny Ringo with Don Durant and displayed, Sears Store opened and displayed, Wooden Horse of Troy, rarest Marx miniature opened and displayed, The Untouchables (opened with Mike Handley) plus Mighty Mo Cannon, surprises. Comes shrink-wrapped in colorful box for your collection! Filmed in Texas in "TODD - AOk"
This movie, produced with pride by Alamo enthusiasts at Atomic Home Video and Playset Magazine, is available now. 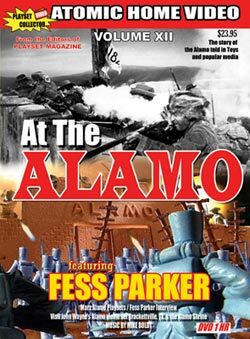 The Story of The Alamo told in Toys and Popular Media "
- Fess Parker interview (arrangements by Wm Chemerka) and a nice clip with legendary Virginia Shahan. - Topping it all off, there's a special interview appearance by Frank Thompson. In addition there's some wonderful Alamo Dioramas, plus the Ideal Alamo playset of the '50's; glimpses of the BMC playset, CTS playset and some contemporary Alamo playsets and Alamo metal figures. - Dimitri Tiomkin's music has been licensed and performed by Mike Boldt with a truly outstanding rendition of "The Ballad of the Alamo" and many more selections. - and a rare, never before seen Alamo TV spot (with many surprises) (this is a parody done with toy soldiers). - A SPECIAL CLIP WITH FESS PARKER, REGARDING "DAVY'S MOTTO"
And toy trips to Monument Valley and Disney World! 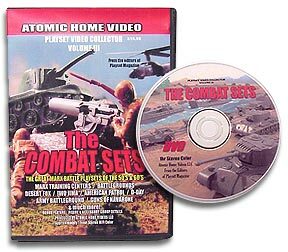 Rarely has Atomic tried to “round up”all the sets in a given theme for viewers of their high definition DVDs, but the Marx Blue & Gray sets are all here on one enjoyable DVD. For the first time ever in the hobby, accurate information is available on the exact contents and differences in some of Louis Marx & Co's greatest Civil War sets. From the earliest sets like American Heroes through the first boxed playset, through the Centennial and Giant (smackdown included!) to Heritage and HO sets. The No. 4658, No. 4759, No. 5959, No. 4744 & 4745. No. 4760, No. 4762, and a mint boxed opening with Rick Eber and Craig Remington of 4744 in what turns out to be the super rare color version. Each of these is handsomely examined, from beautiful , complete displays, or factory demonstrators, some are opened bag by bag so you can see the original intent of the firm. The material moves swiftly, so repeat viewing's are advised! Four big Bonus Chapters include the complete original recording of the Marx Giant Blue & Gray Record (a Marx Giant set exclusive), a chapter on exact Marx Civil War figure groups, and a deleted chapter, more. 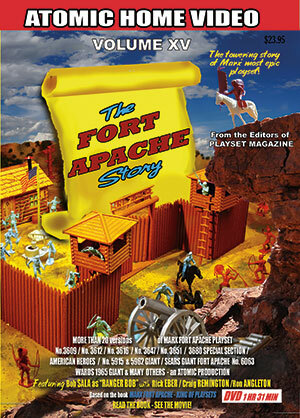 Atomic's newest DVD, “The Fort Apache Story” is on the warpath! Open the gates to our companion to Fort Apache – The King of Playsets book, and more than 20 select Fort Apache playsets shown in detail. There's the full story of the 60mm sets, the Famous Americans, the Rin Tin Tin sets; even a few obscure sets. Then move on to the "are we or aren't we" transition to the 54mm sets. See gorgeous displays, and a special segment on the Revised 60mm Pioneers -- for once, end that bit of confusion! 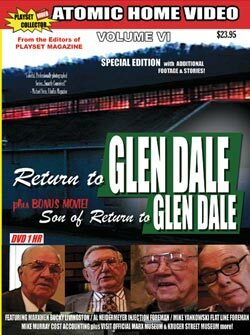 This sparkling new DVD is a companion piece to our new book, “Fort Apache The King of Playsets,” but it’s not the same. There is more information in it, and different information, while we follow the twenty-year timeline of the set and review its many highlights. 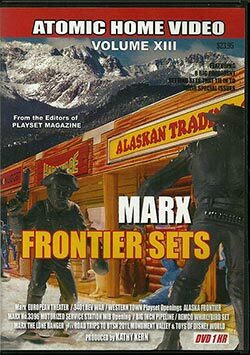 The film also introduces Ranger Bob, whose near-comic love of the 60mm figures may tickle some and make others laugh (along the lines of Michael Jordan’s Box Doctor in previous films we have released) plays counterpoint to the “high drama” we present of the Marx playsets. Plus there are a few other makers’ forts as well, like a side trip to Paragon Miniatures and a visit with Gene Abravaya to see the new Fort Apache. Along for the ride are Rick Eber, Craig Remington, Ron Angleton, Jim Clouse, and interviews with many other collectors who tell their personal stories as the Fort Apache story unfolds before your eyes. 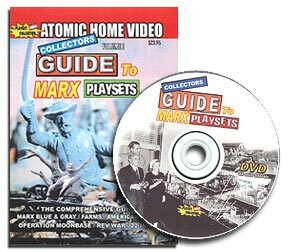 The movie features Marx Fort Apache sets in detail, discusses what they have and don’t have, big changes as they occur (we follow the complete timeline from 1951 - 1970) and their exclusives, boxes, character figures, etc. 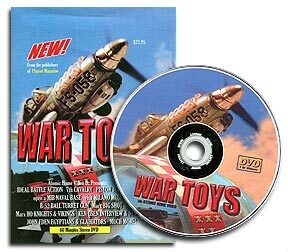 This new DVD has bonus chapters on the Polka Dot Boxed Indian reinforcements, and all the specific figure groups (45mm, 60mm, and 54mm and Revised 54mm figure groups) which were incorporated into during the famous the playset’s thirty-year timeline). We are very proud of our newest production, and invite you on an eye-opening adventure into the Old West as we Open the Gates to the Marx Fort Apache's as-yet Untold Story! So get your raiding / watching parties all set up, because we ship FAST (within an hour or two in most cases) because we are fully staffed and working for you each and every day. It's bigger, longer, with more fun and information than ever before, but its still just $19.95 plus shipping from your friends at Atomic. Credit cards accepted, of course. Or send checks or just call 719 634-7430 and yell, "OPEN THE GATES!" to Fort Apache the movie!